Although mattress cleaning is not the most widely requested type of house cleaning service it is one of the most important ones health wise and here is why. When new, a mattress is free of any allergens such as dust, dust mites and their droppings – quite unpleasant indeed, but in time, the accumulation of such pollutants and irritants in your mattress can pose a risk to your health so it is highly recommended to use professional mattress cleaning service at least once every six months. You can try aerating or sunning the mattress but this will only be a band aid solution to the problem and only postpones the inevitable. 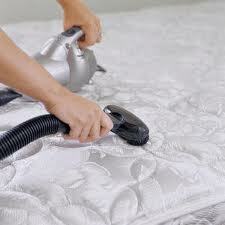 The cleaning process to which the mattresses are subjected is very similar to carpet cleaning. It all begins with a thorough, deep vacuuming in order to lift the larger bits and pieces. The cleaning process not only collects all the debris but also kills off any bacteria and dust mites as well. Our cleaners will also attempt to clean off any stubborn stains of both organic and chemical nature from the mattress in order to give you a fresh look to go with the fresh feel of the mattress. Our professional mattress cleaning is free of any chemical toxins and poses no health risk to you or your family. The only solvents used will be those for the lifting of stubborn stains or the removal of odors and they leave no trace or residue in the mattress or the room. The cleaned mattress will be ready to use in a few hours time after the cleaning has been completed. The mattress cleaning service is available as a standalone order or in combination with other similar services like carpet or upholstery cleaning. Our customers can receive free of charge, no obligation quotes and flexible appointment hours for extra convenience. Ensure yourself a good night’s sleep and clean your bed of any allergens and irritants, call today and book your top quality, value for money mattress cleaning with us. Mattress cleaning doesn’t usually top the list of cleaning chores, but good mattress hygiene is quite important as mattresses are notorious for accumulating dust mites, bed bugs, bad smells and much more. This hardly sounds like the recipe for a good night’s rest so you may want to consider professional mattress cleaning. A new mattress is free of any dust mites, allergens and other irritants, but with its daily use the mattress begins to generate a lot of dust and bacteria which enjoy the warm, humid environment which the mattress provides. Industry professionals recommend that people should perform proper mattress cleaning at least once every six months to guarantee sufficient mattress and bedroom hygiene. Conventional mattress cleaning is one way to do this, but the drying time and the effort spent will surpass the results and will cost you too much in the end. People have also tried sunning and aerating the mattress but these are all band aid solutions to a serious problem. The process used to clean the mattresses is very similar to the one used for carpet cleaning. It all begins with a thorough, deep vacuuming in order to lift the larger bits and pieces. The cleaning process also kills off the bacteria and dust mites clinging to the mattress in order to give you a hundred percent hygiene you can actually feel. Our specially trained cleaning technicians will attempt to lift and remove all those stubborn stains of both organic and chemical nature so you have a nice, clean looking mattress. The cleaning process is toxin free and poses no health risk to humans or pets living at the property. The only chemicals used are those for the removal of heavy stains and they will evaporate with no trace shortly after the cleaning is done. Usually, the mattress will be ready to use in a few hours’ time after the cleaning session. The mattress cleaning service is available as a standalone, though many customers have requested it in combination with other similar services like carpet or upholstery cleaning for extra value for money. Many people don’t pay the necessary amount of cleaning attention to their mattresses as they seem to be an odd and unusual place to clean. This unfortunately is a serious misconception as mattresses happen to generate a great amount of dust and bacteria which over time can become a serious problem for allergy prone individuals and asthma sufferers residing at the property. When new, a mattress is free of any dirt, dust mites, bed bugs and bacteria. In time, with everyday use the mattress begins accumulating all sorts of nasty things, especially when the room is humid and doesn’t see much aeration and sunlight. Caring for your mattress is just the same as caring for your upholsteries and carpets – you wouldn’t leave them dirty and unpleasant, would you. Professional mattress cleaning is the only proven way to clean your mattress of all the irritants and pollutants which may be lurking in there and give yourself a healthy, good night’s rest. It is recommended to perform proper mattress cleaning twice a year, the best way to go about this is to have the mattress cleaning done in combination with other similar services like professional carpet or upholstery cleaning. Most people have tried aerating or sunning the mattress though this is only a temporary solution which doesn’t really do much, whereas professional mattress cleaning is guaranteed to yield results you can see and feel. The mattress cleaning procedure is very similar to the carpet cleaning one, it begins with a detailed vacuuming meant to remove any large bits and pieces. This process also kills off all the bacteria living in the mattress. If there are any stains our cleaners will attempt to lift and remove those using sparing amounts of solvents in order to get job done without bad smells or nasty residues. The stain treatment also deodorizes the mattress and makes it feel soft and fresh. The mattress will be ready to use in a few hours after the cleaning session, though it depends on room temperature and humidity. The mattress cleaning service can be ordered as standalone or in combination.